Anchor Points are a valuable asset to any building or structure. 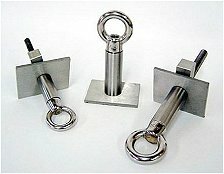 Industrial Rope Access anchor points, suitable for abseiling enable both fall arrest for surface works and also full abseiling maintenance services. Like any asset, Anchor Points should be inspected and maintained to ensure safety is achieved. Anchor Points should be visually inspected, mechanically tested, tagged and certified every 12 months or wherever there is a concern that they may need inspection & servicing. Should an Anchor Point fail to meet strict standards as set out by OHS, Workcover & Australian standards legislation, the anchor point should be removed and replaced by a competent installation technician. Do you have Anchor Points that need Testing and Certification? Call Advanced Solutions Group today on 1300 789 474.